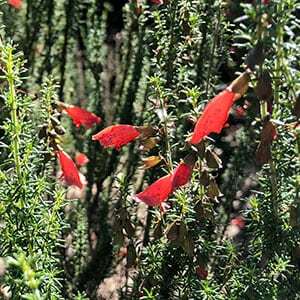 The red flowering mint bush is Prostanthera aspalathoides, a small shrub with aromatic foliage and red tubular shaped flowers. Widely found in north western Victoria through to South Australia this is drought tolerant plant that attracts nectar seeking birds to the garden. The main flowering period is from spring to summer, spot flowering through the year is also common. The aromatic foliage makes it a suitable plant for a sensory garden. In a very well drained soil and an open sunny position this is an easy care plant. This is not a plant that is suited to humid conditions or tropical climates. Grafted varieties can also be round, and generally these may be more suitable for general cultivation outside the natural range. Light pruning immediately after flowering will keep the plant in a more compact and bushy shape. Hard pruning into older wood is not recommended as with other Mint Bush Varieties. Flowers – Red to Orange with a yellow flowering form also available.